Yes, it's Wednesday. That fun day where I and many others share our desks for all the world to see. Yep, and this is all brought together by the head desker Julia at the Stamping Ground. We are coming VERY close to the 8th anniversary of this weekly tour of desks. I've been involved for about 6 years or so. It was a busy day yesterday. I FINALLY got to my desk to work on some card fronts for a swap. They're not done but I have a good start. Gotta have them done by Saturday when I head to Tucson for a fun video party put on by FSJ called RG Presents. I'll share my cards next week. The stamp set we got with our "Bundle"is a hoot called Too Cute. It has 3 adorable little girls and some text. I'm thinking this set will be great to use to make cards for our teenage granddaughters. But I'm getting sidetracked. You came to see my desk. You can click on the photo to enlarge it if you desire. But I can explain a bit of what's happening. 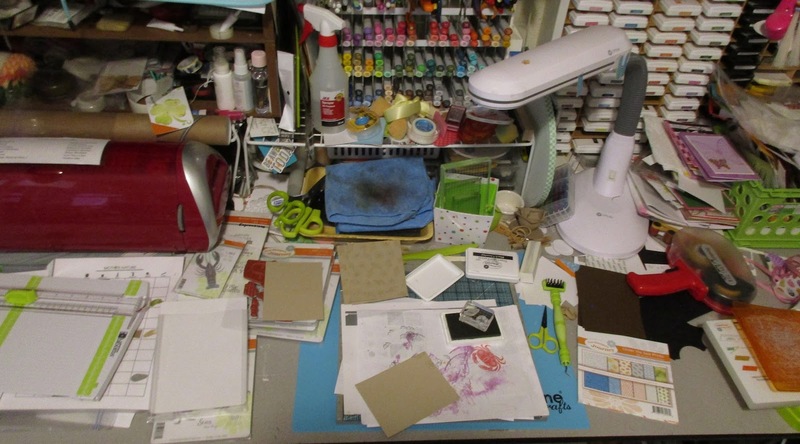 From left to right: Paper trimmer sitting in front of my Cricut along with a bunch of stamps. Behind my Cricut is a shelf of all kinds of goodies such as craft glue, Glaze, Baby Oil (for my watercolor pencils). Middle is the scrap paper where I am stamping. There is a stamp sitting on an ink pad and the piece of Oatmeal Cookie card stock that I'm stamping. Behind that is my cleaning rag and Copic markers. To the right, a pad of paper, my OTT light, tools, and Amaze die cut machine. Behind that is my rack of ink pads and a pile of cards and basket of scraps. Ok, that's the grand tour. I have no projects because what's on my desk is the first project I've worked in quite a while. But if you come back on Friday I'll share the card fronts I'm working on. But now please head over to the Stamping Ground and check out the other links of desks. Grab your favorite cuppa something as it can take some time. I'm dog and kitten sitting so I will be popping back and forth. Fun desk as usual Carol - but can you explain the association of baby oil with watercolour pencils. I've never heard of that combination before! Lots going on there today - so much to look at. Hope you get the card fronts done. Lots happening on your desk this week. I bet the baby oil smells lovely, do you use it for blending the pencils? Don't feel bad about having been any less busy than normal. I was away for over a year and with nothing on my desk worth seeing at all the entire time! I like that pen rack. Great busy desk! I think we all have those slow periods. I'm going through one now. Ended up doing a bunch of backgrounds, but not a lot of making lol. You're right - you do have a very busy desk. Looks great.